Too incomplete to be assessed | MPNP Application - Gateway to Canada | Canada Immigration Consultancy! It looks like that more and more MPNP applications are being returned because it's too incomplete to be assessed. I've been receiving emails from my blog readers asking about it. I actually encountered similar issue with one of my clients few months ago. The problem with this kind of refusal is that MPNP does not identify which documents are lacking. 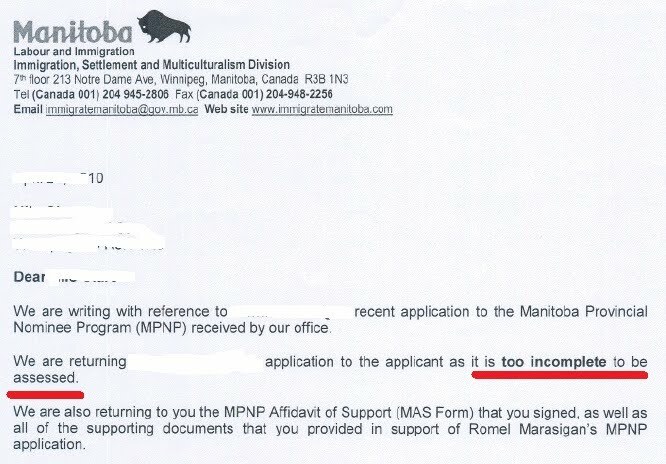 In my client's case, there is no way that it will be incomplete, considering that we kept a scanned copy of the application forms and supporting documents sent to Manitoba - every single pages of them. As to why is was classified to be TOO INCOMPLETE TO BE ASSESSED is a total mystery. The recourse here is to refile the application. But this is really not fair. 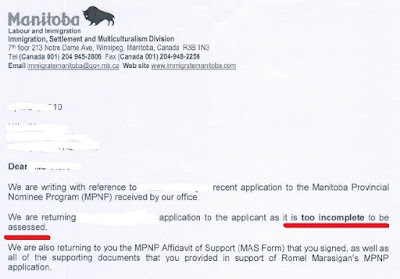 I hope Manitoba Provincial Nominee Program is not ending soon like rumored earlier? But why are they refusing an application like they are no longer interested in accepting new applications? Do you have similar experience?